Independent brewers Brewdog have never been ones to shy away from controversy. In 2010 the craft brewery came up with a 55% beer. As if that wasn't extreme enough, they sold it packed inside dead squirrels and stoats that had been killed in traffic. They've brewed beers at the bottom of the sea, dispensed beer from a specially modified deer's head and generally shocked and appalled the Daily Mail. Described as a protest to 'take the wheels off the corporate bandwagon' of a certain sporting event due to start imminently, Brewdog hope that the beer will undermine the sponsorship deals surrounding the Olympics, with humour. 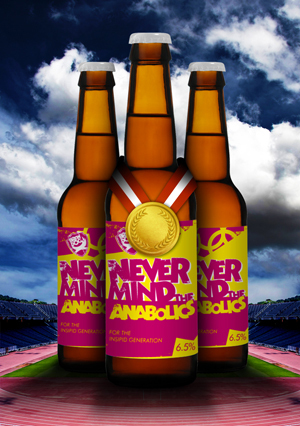 'Never Mind the Anabolics' contains Creatine, Guarana, Lycii berries, Kola nut, Gingko, Matcha tea, Maca powder and steroids, eight substances banned for consumption by Olympic athletes. James Watt, co-founder of the brewery had this to say. This kickback comes in the wake of a series of claims about the IOC's heavy handed behaviour with regards to the Olympic logo. Last week it was reported that a pensioner had been told to withdraw from sale a doll with a handknitted Olympics jumper, in order to avoid legal action. In a further dig at corporate sports sponsorship the brewers will also be donating a percentage of proceeds to buying a new surfboard for surfing dog called Abbie!